We’ve found our favorite pizza dough for our family! It is almost straight from the borrowed bread maker’s instruction booklet. We find it to be like the dough from our local pizza joint. Hint: It’s by the tracks. Top with your favorite flavors. For this particular night, I made half meaty and the other half vegetarian. 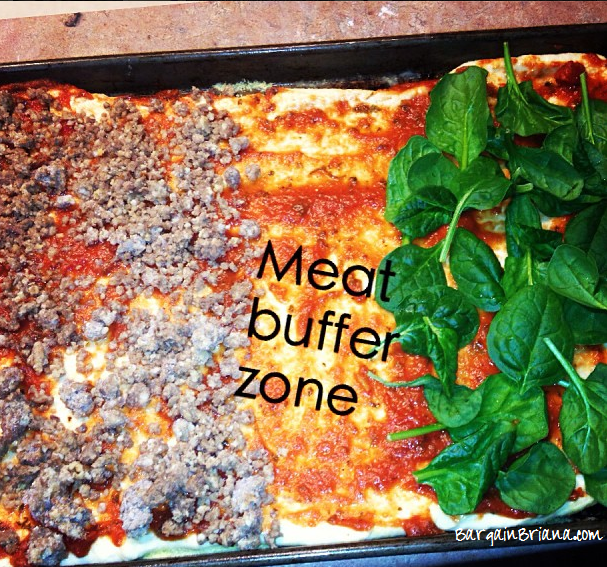 You will note the so called buffer zone so we make sure there is not any rogue meat on the vegetarian’s portion. The dough takes about two hours total to complete with the bread maker. I’ve been doubling the batch and making two pizzas – one for dinner and one for the freezer, which is a quick way to fill our freezer with homemade meals. 1½ teaspoon bread machine/fast rise yeast OR 2 teaspoons active dry yeast. Add ingredients to your bread machine per instructions. Remove from machine. Place on floured surface. Knead for 1 minute. Allow to rest 15 minutes. Roll dough to fit into pan. Place into greased pan and press dough into pan, formed an edge. Allow to rise in a warm, draft free place for 20-25 minutes. Top with 8 ounces of pizza sauce and favorite toppings!